The mental aspect of training for Kerrville Triathlon is just as vital as the physical. You can cycle all the miles, swim all the laps, and complete all the brick workouts. But if you don’t prepare between your ears you’re not fully prepared. This is where motivational quotes can be quite helpful. Many people use quotes or short sayings to keep themselves going when it gets tough. They place these messages where they’ll see them most, mirror, gym bag, refrigerator, locker, etc. Sayings are memorized and repeated when needed most during a tough portion of training. Click below to sharpen your mental preparation with four of our favorite motivational quotes! These can push you through a difficult time, just when you need it most. When you come out on the other end, you’ll be that much more prepared for Kerrville Tri on Sept. 28-29! Do you want to improve your kick strength, ankle flexibility, body position, and increase your speed in the water? Of course you do. Use fins during some of your swimming workouts! With the right amount of training and overall improvement, you’ll improve your Kerrville Tri swim in Nimitz Lake. Wearing swim fins increases the amount of resistance your muscles experience as you kick, guaranteeing you’ll put your leg muscles to full use. Stronger legs and the additional strength will carry over into normal swimming when you’re not wearing your fins. Another benefit of using fins is improved ankle flexibility. This stems from the extra force the fins place on your ankles as you kick. Increased ankle flexibility will result in a more efficient flutter kick through better angles of attack in the water. When you are unable to fully flex your ankles into a streamlined position the ankles remain somewhat bent, catching water instead of propelling the body through it. Do you have some other new swim equipment? This Rookie Tri blog shows you how to incorporate other swim equipment to your triathlon training. You’ll want to focus on a slow-motion, over-exaggerated flutter kick. During this workout, focus on slowing down the kick cycle and dramatically increase your range of motion. The over-exaggerated technique allows swimmers to more easily tune into ankle flexion and proper body alignment throughout the kick. As a bonus, this drill is also quite taxing on the legs and core – the increased workload of a large kick also makes for a great strength-building exercise. Trainers and Rollers: Which One is Best for Me? Bicycle trainers and rollers can come in handy when your training moves indoors. Many factors can force this switch, from weather to time restrictions. Price, skill level, usage, and ability can all factor into your purchasing process. Use the info below to your advantage when shopping for trainers and rollers. Magnetic trainers are the best bang for your buck. Wind – This affordable unit runs between $85 and $120, but expect a lot of noise. It is best used for short rehab stints, monthly rainy day riding sessions, or someone on a really tight budget. 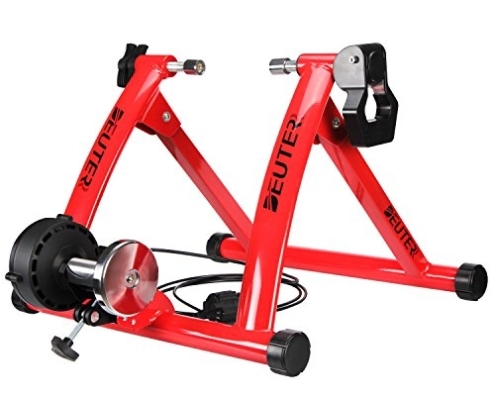 The noise from this type of trainer is caused by human force against the tire and from the small channels in the unit that catch air and add resistance. Due to the noise level, it is hard to watch television or listen to the radio while in use. Changing resistance levels is cumbersome because one must get off the bike to tighten or loosen the resistance to simulate different terrains. Although affordable, the parts of this unit are not created for heavy everyday use. Unnecessary wear to the rear tire will also occur when used daily. Magnetic – Based on price ($125-$250), durability, and noise projection, this is the most practical unit of the three. It is not exactly like riding on the road, but similar enough. The mag trainer is set up like the wind trainer, but uses magnetic resistance instead of wind. This trainer allows for TV viewing and music listening. The unit also stands up to multiple rides per week. It will simulate multiple terrains just by changing the gears of the bike. Some units come with a wired remote shifter to change resistance without getting off the bike. Fluid – The most expensive of the three types of trainers is the fluid trainer . This unit best mimics the feel of being on the road. Prices range from $250 to $399 but will definitely stand the test of time. It is the most durable trainer because it is designed for serious indoor cyclists who will spend hours a day on it. The resistance of this unit is controlled solely with the shifters on the bike. Rollers require great balance and handling awareness. Like trainers, rollers also come in different levels, but they all use the same type of resistance – human resistance. The main reason to use rollers is to work on bike handling skills. Rollers increase handling skills by increasing balance on the bike. This is crucial for draft-legal racing and riding in tight quarters. Rollers take a constant state of awareness while in use. The price of rollers (between $175 and $399) is determined by the type of material from which the drums are made – aluminum or plastic. Aluminum rollers cost a little more but will last longer. Plastic rollers will generally not last as long and will also wear the tire out quicker. Both trainers and rollers have their purpose in the sport of triathlon. Trainers are more practical for everyday use because they meet the needs of the fitness cyclist: set the bike up, pop in a movie and ride. They are safer (than rollers) and easier to use for a large number of people positioned in one place. They are a good replacement for getting a nice ride on the road. Rollers, on the other hand, are more of a tool than a ride replacement device. They are used for serious cyclists to help increase cadence efficiency and balance on the bike. Rollers are not recommended for beginner cyclists because of the safety factor. 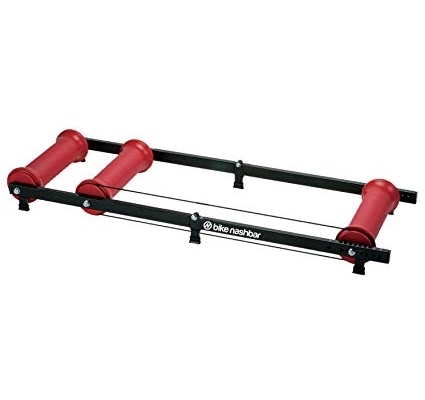 Both trainers and rollers are foldable and easy to store. https://kerrvilletri.com/wp-content/uploads/2018/07/KerrvilleFeatureImage-1.png 400 495 William Dyson https://kerrvilletri.com/wp-content/uploads/2018/06/2018-Kerrville-Triathlon-Logo_no-presenting-300x180.png William Dyson2018-07-23 12:21:352018-07-23 16:55:32Trainers and Rollers: Which One is Best for Me?